Here you can download Java Runtime Environment 8.0 Latest Version 2016 Setup For Free (32 Bit, 64 Bit). Run Java-written applications more conveniently and easily. As suggested by its name, Java signifies a runtime environment to play applications that are built in Java programming language or “Applets”. 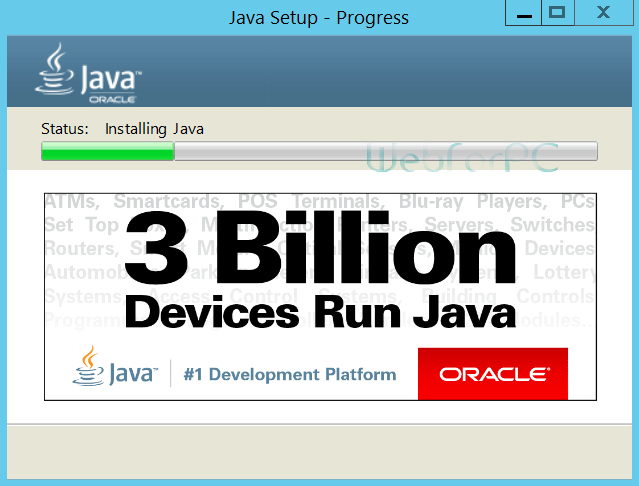 Java is being used by billions of devices across the world and this is an official claim by developer’s themselves. JRE allows a user to play Java supported games, 3-dimensional environments, loading chat clients and other applications that are mandatorily requiring the product in discussion. An experience provided by JRE 8.0 is a significant way to get connected to richer interaction that is to be established between E-commerce industry and by Enterprise class to launch and develope related apps. Applets for their living require a stable platform including libraries, the Java Virtual Environment and other integral components to meet its demands in literal sense. 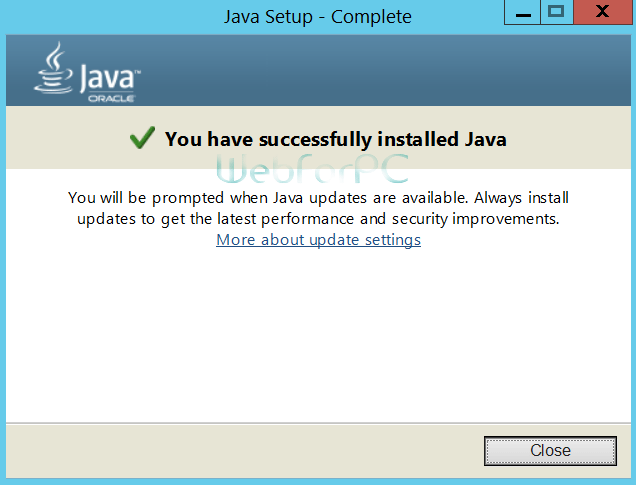 Java Runtime Environment 8.0 latest setup is available at WebForPC for both 32 Bit and 64 Bit. 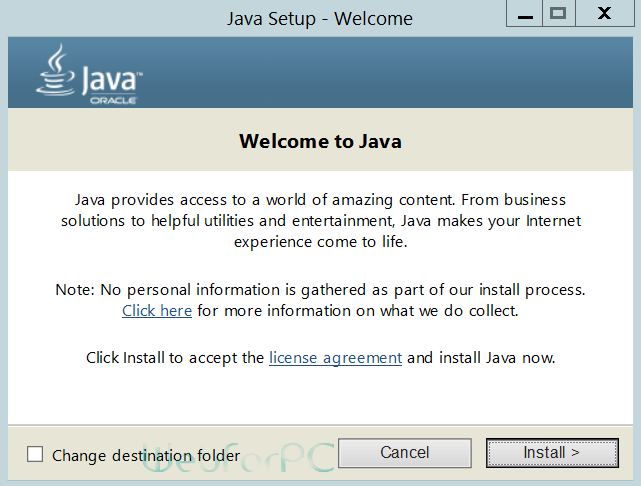 Java Runtime Environment 8.0 is available for Windows PC, Mac and Android devices (Smartphones, Tablets). JRE is basically developed to cater two kinds of needs that are ever being demanded to be fulfilled by stuff that require JAVA. And that are, 01-to provide a browser extension that helps to run required apps within the browser itself, and that is being accomplished by Java Plug-In that is ready to be integrated with famous browsers like Chrome, FireFox and Mozilla. In a second place deployment of standalone applications is also possible with JRE. Now Java is required by modern applications that are requiring some sophisticated programme to execute them, further many advertisements companies are also developing captivating ads by using Java as a programming language. JRE is available to cross-platform applications and is operational on multiple operating systems. Friendly applications are downloaded to a sandbox that is guarded and with multiple layer of security, but further security settings may also be set up as per user’s desire. JRE is an environment that is nowadays a requirement for some modern equipment in corporate sector, banking and also in networking setups. Apart from the review taken above, have a look at some features representing the JRE release 8.0 Build 92. More libraries to meet the demands of complex apps. Optimized for more richer experience. Plug-In Technology in Java 2 Runtime Environment. Sandbox to impose security restrictions. Automated integration for Google Chrome and FireFox. Available for Mac, Android Devices and Windows. Programmed for the smooth running of Applets. Application’s Nomenclature: Java Runtime Environment 8.0. Updated Here On: 19 July 2016. Setup Size: 59 MB & 52 MB. Setup Name: WebFroPC_jre-8u92-windows-i586.exe, WebForPC_jre-8u92-windows-x64.exe . Compatibility: 32 Bit and 64 Bit Systems. System Required: 512 MB RAM, 100 MB Disk Space and Compatibility with Windows Edition. Java Runtime Environment 8.0 is one amongst those applications or setup that should be installed straight away on your system. Further in order to avoid the hassle which you face, whenever an app, game or graphical texture is requiring JRE. Browser would be integrated with JR libraries in an automated way, controlling and furnishing the Java requests for future, without any struggle. Java Runtime Environment 8.0 is available for Windows XP, Windows 7, Windows 8 and now for Windows 10 as well, and is perfectly compatible with both 32 bit and 64 bit system architectures. Just download the required setup from the link below.